Membership Renewals are due now - Membership. The membership fees remain the same as last year. Monday 22 April - Crackington to Boscastle. Meet at club house 08:00 returning late (9pm). Suitable for experienced paddlers. Send Tash a text if you want to join 07979496862. Information on joining us, coming along on sessions or trips as a guest, water levels and equipment. Sunday 24th March Successful race complete. Thanks to all that came and made the day great. First Wednesday evening session of the new Summer season will be at 6pm on 17th April. All those that gained Club Std or 2* last year are welcome to join us on Wednesdays this year. Come and see the club and have a try at kayak or canoe to see if you like it. Sat 13th April &/or Sat 27th April &/or Sun 12th May (depending on weather). Here is the Axe Estuary Hazard and Risk Poster for the Introductory Course and new members. We also offer Taster Sessions to local groups and schools. Also safari tasters with East Devon Countryside Rangers. 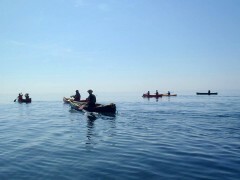 sea kayak gathering in Purbeck. Regatta London - Paddle the Thames in London when its closed for the day to other boat traffic. Ad-hoc trips may still occur depending on weather and water conditions, so weekend trips are also arranged, on a "casual" basis, including surfing or other paddles. Arrangements are done via phone or Facebook - so look if you are interested. 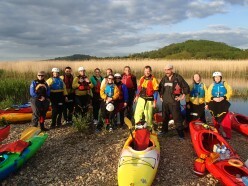 The club is based in Seaton, Devon and offers a wide variety of canoeing disciplines including: touring, white water and sea paddling, in both canoes and kayaks. We have a range of fully equipped canoes and kayaks including all the personal kit to go with them: buoyancy aids, cags, spray decks, helmets and over trousers. The club house has hot showers and facilities for refreshments. We have over 100 members but are always looking to include new members to strengthen the club and provide you with new skills and an enjoyable time paddling. If you are interested in how to join us or our introductory and improvers courses, then look at Interested in Joining or the Courses page.